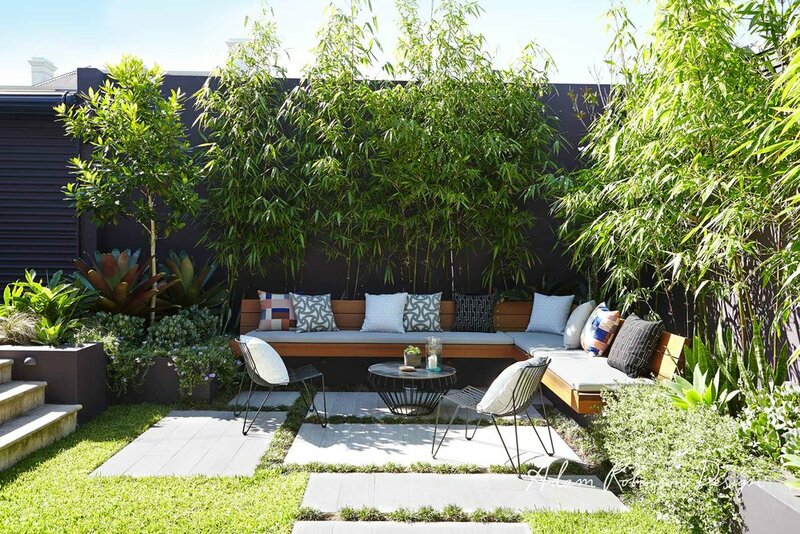 This compact suburban garden was designed specifically with the family of four in mind, who would inhabit it and to suit their lifestyle. They wanted a flexible and versatile space that could be used in a multitude of ways; for relaxation, reading, painting, and quiet conversation, as well as activities such as barbecuing, dining, entertaining and kids play. The doors at the rear of the house opens up completely, making the outdoors an extension of the entire living space. The style of the interiors is uninterrupted and is carried through to the outside. The mirror creates depth and acts as a magnet drawing people to explore the garden. 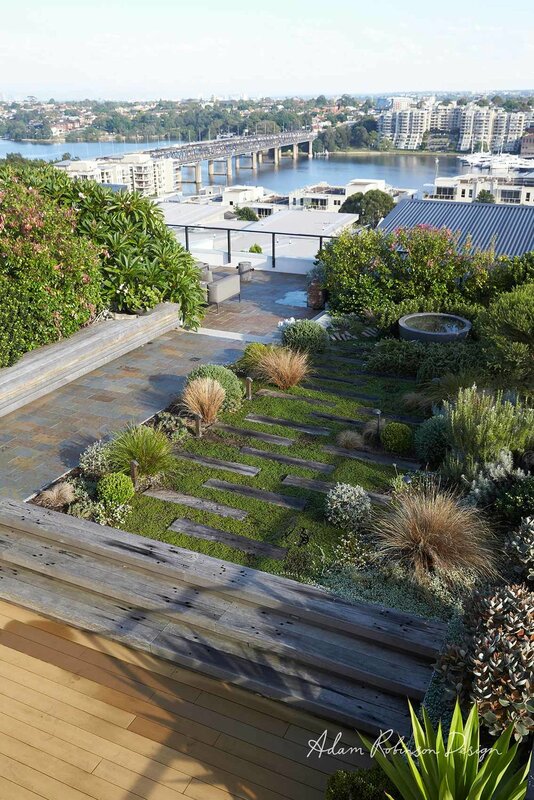 The way the paving transitions from solid paving to planks then break down into pebbles of the same colour and then integrates with the green grass into a full lawn is an inspired treatment underfoot. It’s a great play on textures and the integration is a more organic approach than one surface abruptly stopping where another begins. 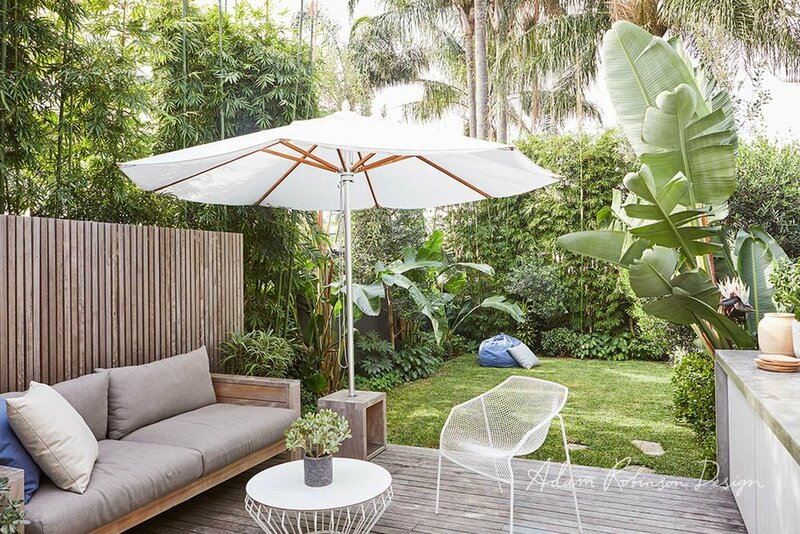 The planting behind the timber benches is a nice touch as you are cocooned in nature when seated maximising your connection with nature. It’s a sensory experience as you can hear the rustle of the leaves moving in the breeze because foliage is right by your ears. Small design details like this can make such a big difference to how relaxing and rejuvenating a space can be. Bamboo planted against the fence successfully screens the apartment block next door, making this a secret haven in the middle of the inner-west of Sydney.